who has a long history of championing the cause of persons made to go missing through enforced disappearances. In a public statement issued in early August the Foreign Minister explained basic details about the envisaged Office of Missing Persons bill.Samaraweera in that statement said – “The Bill outlines four main functions for the OMP: (i) searching and tracing of missing persons, (ii) clarifying the circumstances in which such persons went missing and their fate, (iii) making recommendations to relevant authorities in order to reduce incident of missing and disappeared persons, (iv) identifying proper avenues of redress. As such, it is not a law-enforcement or judicial agency but a truth-seeking investigative agency”. Sri Lankan activists of the ‘Dead and Missing Person’s Parents’ organisation hold placards as they take part in a demonstration outside the United Nations offices in Colombo on May 10, 2016. Foreign minister Mangala Samaraweera went on to say – “The Office of Missing Persons is truth-seeking investigative agency. It does not make judgements on disputes. In fact, the legislation states that “the findings of the OMP shall not give rise to any criminal or civil liability.” Its primary function is to establish whether a missing persons is dead or alive and, if they are dead, discover when, how and where they died”. “Tens of thousands of people were forcibly disappeared in Sri Lanka since the 1980s, including during the last months of the war between the government and the Liberation Tigers of Tamil Eelam (LTTE) in 2009…… The UN Working Group on Enforced or Involuntary Disappearances ranks Sri Lanka as the country with the second highest number of disappearances in the history of its tenure. Most of those reported disappeared during the three-decade long conflict between government forces and the LTTE are ethnic Tamils. A short-lived but violent insurgency with a majority Sinhala militant group in the country’s south in the late 1980s also led to many enforced disappearances and other abuses by both sides. 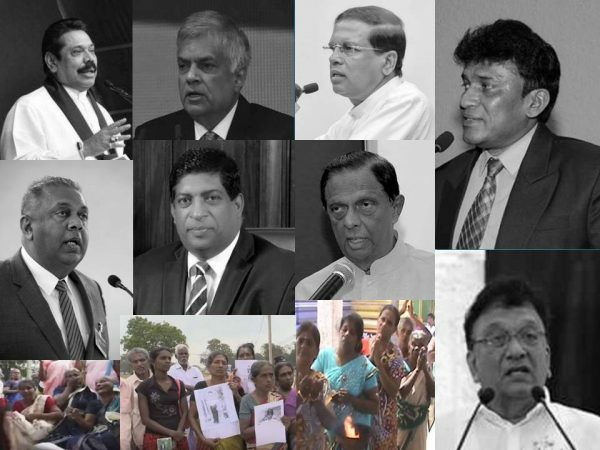 Various commissions of inquiry established by successive Sri Lankan governments in response to pressure from victims’ groups and others have produced reports that have largely remained unpublished and have not resulted in criminal prosecutions of those responsible”. Despite the aura of hope and optimism exuded by Foreign minister Mangala Samaraweera , it is too early to speculate on how the Office of Missing Persons would function in the future and how it would tackle the prickly issue of missing persons and disappearances. The undue hurry and controversial manner in which the bill was passed without a vote being taken and the obstructionist tactics displayed by Parliamentarians loyal to Mahinda Rajapaksa give rise to perplexing doubts about the future. An important point to note is that many of the disappearances formed part of the perceived counter – insurgency strategy adopted to combat the LTTE. Nevertheless the passage of the bill to set up an office of missing persons is by itself an accomplishment. More importantly it signifies that the Sri Lankan nation has shed its customary denial mode and realistically acknowledged the existence of the missing persons/disappearances problem. The issue of enforced disappearances was but one in a long list of problems affecting the Tamil people of Sri Lanka during the war. People suddenly disappeared or went missing . Many were abducted by unknown groups travelling in white vans. This led to the usage of the phrase “White –vanning”.There have been some incidents where Muslims and Sinhala people also went “missing” during the conflict but the overwhelming cases of “Missing” or “Disappearances” pertained to the Tamil people alone. Though these incidents of people going missing were loosely called “disappearances” they were in reality “involuntary disappearances” or “enforced disappearances”. The issue of disappearances has been a recurring phenomenon in Sri Lanka. The Janatha Vimukthi Peramuna (JVP) insurgencies of 1971 and 1988 – 89 saw thousands of people mainly youths being killed or made to disappear. Officially sanctioned unofficial abductions and executions were the order of the day. While this method was consciously adopted by the state to defeat the insurrection the JVP rebels themselves were responsible for several killings and disappearances. Quantitatively state repression was much more than the JVP violence in this sphere. Likewise the long years of an on – going ethnic conflict also saw much Tiger terror, counter – terror, inter – terror, intra – terror and state terror. Tamil youths were taken , tortured and murdered in 1979 when Junius Richard Jayewardene declared emergency for Jaffna and sent his nephew “Bull” Weeratunga with orders to wipe out terror in all its forms before Dec 31st.Similiar incidents as well as other types of “disappearances” took place frequently thereafter. There were many instances in the past where disappearances and mass executions were perceived as part of deliberate state policy to quell the separatist threat. The Special Task Force in the East excelled at this type of counter – insurgency warfare. In 1996 after the security forces took over Jaffna more than 500 Tamil youths disappeared. Some bodies were later discovered at the Chemmany mass grave. While the security forces were allegedly responsible for many disappearances and executions of Tamils in the past , the Tamil armed groups particularly the LTTE too were reportedly involved in such activity. The internecine warfare among Tamil guerilla organizations contributed greatly to this situation. There were also a lot of internal killings. Moreover people suspected of being spies, informants and traitors were also victims made to disappear. There were also instances of people being abducted for interrogation or for ransom. Many died in custody and were termed missing. The issue of enforced disappearances and persons going missing assumed immense proportions after Mahinda Rajapaksa became President in 2005. The war effort against the LTTE intensified under the triumvirate of President Mahinda Rajapaksa, Defence Secretary Gotabhaya Rajapaksa and Army Commander Sarath Fonseka. Violence began escalating from 2006. So did enforced disappearances. Interestingly most of the enforced disappearances in the 2006 to 2008 period were in areas controlled by the Government. Large scale disappearances took place in Colombo, Negombo, Dehiwela, Puttalam, Chilaw, Ratnapura, Avissawela, Wattala, Ratnapura and Kandy. Persons also went missing in Government controlled areas in the Jaffna, Vavuniya, Mannar, Batticaloa, Trincomalee and Amparai districts. A vague pattern was discerned in the incidents occurring in the areas controlled by the Government of Sri Lanka (GOSL) . The disappeared and those reported dead could be divided into four broad categories. One category was that of people suspected to be linked directly to the LTTE. The second category was that of people suspected of being linked indirectly to the LTTE. The third category was that of businessmen suspected of being linked directly or indirectly to the LTTE. The fourth category was that of businessmen, professionals etc being abducted to extract huge sums of money as ransom. Two important aspects of the White Van Culture that prevailed at that time was the deployment of Tamil armed groups in abducting persons or making them disappear and the targeting of affluent Tamils to extract huge sums of money as ransom. Although disappearances and killings began as a calculated campaign to weed out and eradicate suspected LTTE elements. There were many instances where such acts were committed to make money alone and nothing else. The LTTE campaign of enlisting “trained civilians” as the so called “peoples force ” (Makkal padai) to attack the Police and security forces in GOSL controlled Jaffna made the state fully aware of the “enemy within”. The LTTE functioning officially as the “political wing” withdrew leaving the civilians to face the consequences. Many pro – tiger families also relocated to the Wanni. During the LTTE’s unbridled “occupation” of Jaffna after the 2002 ceasefire several public demonstrations were held. All of these were videoed by the security intelligence. Later those in the forefront of those demonstrations and those engaged in organizing them were identified and killed. Students involved in demonstrations were also targeted. At the same time several people trained by the LTTE in combat or planted by the tigers as intelligence operatives were also killed or abducted. In Jaffna elements linked to the Eelam Peoples Democratic Party (EPDP) were allegedly responsible for many of these acts. The EPDP maintained a public political face at one level.EPDP political activists selling the “Thinamurasu” newspaper were unarmed and relied on Police and army protection to move about. The LTTE often killed these EPDP activists ruthlessly. But there was another killer group of EPDP elements closely connected to Sri Lankan intelligence and security forces. It was this outfit which engaged in abductions, extortion and killings. In Batticaloa the Karuna led LTTE breakaway faction known as Tamil Makkal Viduthalaip Puligal (TMVP) was involved in abductions , killings and extortion in the form of taxes. The TMVP also opened branches in Trincomalee. Tamil traders were taxed ruthlessly. Also Tamil community leaders and businessmen were killed. In Colombo the situation in the period after the 2002 ceasefire was one where the LTTE was killing suspected informants, para – militaries and members of alternative Tamil parties like the EPDP. Many Tamil businessmen were also compelled to pay money. The LTTE also infiltrated Colombo by planting its agents in different places. Some businesses were also opened by tiger stooges. Initially the abductions and disappearances were directed against these suspected LTTE fifth columnists. The EPDP was of help in assisting state intelligence. But soon the Karuna faction overshadowed the EPDP. In fairness to the EPDP it must be said that the party had a definite political program and was earlier reluctant to confront the tigers. But the LTTE forced the EPDP to join forces with the Security intelligence and collaborate actively in anti – tiger action. The Karuna faction like the mainstream LTTE had no comprehensive political agenda. They were solely dependent on the state and were guided and controlled by the state’s “intelligence” handlers. In Mao Ze Dong’s parlance the TMVP cadres were like the “running dogs” of Imperialism. The “enforced disappearances” of many affluent Tamils was not political or related to counter – terrorist procedures. Most of these were nothing but extortion related abductions. It had become a lucrative industry. The actual number of incidents were not reported to the Police or even civil society organizations like the Civil Monitoring Commission. Many people negotiated on their own and got their loved ones released through paying a reduced sum. They later keep silent. In many cases the ransom paid was so great that continuing to do business became impossible. Some were forced to sell off property to collect ransom money. Also some who got released after paying ransom felt so insecure that they transferred their businesses to someone else and left the country. There were many businessmen in those days who fled to India, Singapore, Malaysia, Thailand, Middle – East and Western nations to escape being victimised. Some abducted persons later told families that their abductors simply flashed their ID cards at check points and got clearance. In some cases the abducted persons were gagged and bound and forced to lie down in the vehicle while their abductors placed their feet on them. The security personnel at checkposts were apparently not aware of abductees being in the vehicle.According to versions trotted out by released victims there were safe houses in Colombo and suburbs where some victims had been taken. Others were taken to makeshift camps in Polonnaruwa, Amparai and Vavuniya. Usually they were kept blindfolded and allowed time for meals and ablutions during which time blindfolds are removed. They were allowed to bathe once in two days. Some victims were assaulted and badly treated while others were treated well. These vagaries were a result of the personality differences of the respective captors. Victims also said that their captors spoke in Sinhala, Tamil and English in different dialects. What was frightening about this racket was the suspected connivance at very high levels. At least one cabinet minister had demanded and received money for the release of abducted persons. There were also instances of the families and relatives of abducted persons obtaining their releases through contacts at very, very high levels of Government. It was believed then that the only sure guarantee of getting one released was to gain the sympathy of family members of a very powerful, political dynasty.This did not mean that a powerful “clique” was directing all operations at a centralised level. The abductors had autonomy in selecting victims. But if someone was to be easily released without paying up then political help at a very high level was absolutely essential. There was also the patent lack of interest shown in apprehending the culprits if and when complaints were made. Despite much evidence being available no effort was made to trace the abductors. Some members of Tamil Groups were arrested by honest Sinhala Policemen when complaints were made but they were forced to release them due to high level pressure. An Up Country Tamil Deputy Minister went public with the telephone numbers of some abductors who openly demanded ransom. Instead of taking follow up action some Police sleuths summoned the deputy minister for an inquiry and interrogated him sternly about how he got his information. No action was taken. In spite of the pressure faced by the media in Sri Lanka those days I was able to focus on this issue by writing a few articles regarding abductions and disappearances then. I shall briefly mention a few of the incidents I highlighted in those articles at that time. • A Tamil multi – millionaire businessman accused of attempting to de–fraud Customs went “missing” in Colombo after he threatened to expose involvement of people in high places in corrupt activity. Ransom was demanded and distraught family members paid more than three crores of rupees to two Tamil groups for the return of the man who was a diabetic. But the missing person who phoned last from Polonnaruwa district never returned home despite the huge amount paid. • The vice – chancellor of an Eastern university was threatened by an armed Tamil group and moved to Colombo. His resignation was not accepted by the UGC. The VC attended a top academic conference in a high – security area of Colombo. He was last seen around noon at the venue. Many appeals were issued and representations made to then President Rajapaksa himself but the man who went missing remains in the ranks of the “disappeared” still. • The Colombo district organizer of an Up Country Peoples party went missing in Colombo. Within 48 hours of his disappearance the party concerned crossed over from the opposition to the then Government of President Mahinda Rajapaksa. One MP became a cabinet minister and another MP a deputy – minister. But the “disappeared” organizer is still missing. • A young Tamil woman working as financial executive of an airline firm was abducted by unknown persons from her residence in Ratmalana. Nothing was known of her whereabouts thereafter. In a separate incident another young Tamil woman working as an information tech executive in the private sector was also abducted. But she was fortunate in having former UNP Colombo distict MP Thiyagarajah Maheswaran as her uncle. Maheswaran who enjoyed close rapport with President Rajapakse pulled strings at a high level and got his niece released. • Two prominent businessmen – brothers in law – in the jewellery trade were returning home in a car. The vehicle stopped at a Police check point. Two men got in with arms and the vehicle sped off. One of the businessmen a heart patient i was dropped off soon. A ransom was demanded for the other. Negotiations took place and a large sum was paid. The missing man returned home. The family kept “mum”. • A Christian evangelical pastor from Vavuniya district, his two sons and another youth were on their way to Colombo. They were last seen at the Negombo bus stand. They were reported missing and have been classified as “disappeared”. • Another Colombo businessman and his employee went missing. His family was informed by his abductors that a hefty amount had to be paid. They were advised to sell off the business and pay up. Meanwhile some relatives who had links to influential politicians utilised their contacts. Through those connections an appeal was made to a powerful personality in defence circles. The man and his employee were released from a camp in the Eastern province. • A Tamil entrepreneur living in a Western Country went to Colombo because a family member was terminally ill. His vehicle from the Katunayake airport was stopped at the Negombo road junction by Tamil youths in a pick-up. The relative driving him home from the airport was told to keep his mouth shut. Later a massive sum was demanded for his release. The telephone calls were made from Sri Lanka to the foreign country where the family was living. After negotiations to reduce the sum demanded, the money was paid and the man released. • a woman teacher was abducted in Vavuniya. Her family was middle – class and did not have the ransom demanded for release. But her abductors were well aware of her close relatives abroad and their financial status. The relatives were asked to pay up. After bargaining an agreed amount was paid and the woman freed. The above – mentioned incidents are but a few in a long list of similiar ones affecting the Tamil people of Sri Lanka in those days of rule under the erstwhile Human rights champion Mahinda Rajapaksa. There was strong evidence that some members of the Police and armed forces were collaborating in these enforced disappearances. There was also evidence of people in positions of power providing tacit support to this racket.Against that backdrop the average Tamil victim did not trust the Police, armed forces or the Government. Those who had high level contacts used that influence to get their loved ones out. Others negotiated with the abductors, paid up and secured releases. After getting out most victims either left the Country or simply kept quiet. There were however many who remained missing. They still. Remain missing. There were a variety of reasons for this. Chief among them was the inability of family members to pay the demanded ransom.The families of such people were despondent. The only silver lining in that prevailing dark cloud was the Civil Monitoring Commission convened by Mano Ganeshan who was then the Western Peoples Front leader and Colombo district Parliamentarian. The efforts of this body failed to get any “missing” person released but the awareness created helped to minimise abductions to some extent. More importantly it provided an avenue for affected families to complain without fear. On April 9th 2007 the Civil Monitoring Commission held a conference titled “Expression of grief by families and friends of the disappeared” at the Veeramylan hall on Kadiresan street, Colombo 11. In a welcome development the then leader of the opposition and United National Party leader Ranil Wickremasinghe participated along with then UNP Parliamentarians Lakshman Kiriella, Ravi Karunanayake and John Ameratunga. It was an emotional atmosphere with family members holding pictures of the disappeared ones and raising cries. When Ranil got up to speak many relatives converged near the stage and requested him to get their loved ones released. They remained sobbing near the stage during his speech. It was like a mass funeral without the “departed” loved ones. A visibly moved Wickremasinghe promised to do his best. Ranil Wickremesinghe then said that while the Sri Lankan cricketers were bringing glory to the country the government was damaging its international reputation through extra judicial killings and disappearances. He also blamed the media for being silent on this matter. “I have to question the editors on this matter,” he said. Wickremesinghe assured the loved ones of those who had disappeared in the recent past that he would do his utmost to find their loved ones. A large number of relatives of persons, whose loved ones had disappeared and were present at the meeting, became uncontrollable at this.They gathered round Wickremesinghe calling on him to find their loved ones. A petition which called for an independent international human rights mechanism was handed over to Ranil during the meeting. Shortly after this meeting the proprietor of Veeramylan hall who had let the Civil Monitoring Commission conduct the meeting free of charge was assassinated in Colombo. Mano Ganesan himself was under serious threat and had to seek safety in a neighbouring country for a while. Some top Western diplomsts provided him protection for some time after he returned to Lanka. In the same year Mano Ganesan was the selected as first runner – up of the first annual Freedom Defenders award given by the USA. After this the pressure faced by Mano decreased to some extent. All this was in 2007. Much water has flowed under the Kelani bridge since then. Today Ranil Wickremesinghe is the Prime Minister of Sri Lanka. Lakshman Kiriella, John Ameratunga, Ravi Karunayake and Mano Ganesan are cabinet ministers. Despite the protests of Mahinda and his minions this Govt has taken the bold yet praiseworthy step of passing legislation to set up an office for missing persons. It is only a small step but it is the first step. Even the lengthiest of journeys begin with a small step first . « Govt Should Heed Opposition Call to Investigate Serious Allegations Made Against President Sirisena in Australian Newspapers – “The Island”.